This past weekend we were lucky enough to be in attendance at the Lumos screening of Fantastic Beasts and Where to Find Them along with 3000 other excited fans. The anticipation in the room was palpable and the moment the Warner Bros. logo came on screen we were transported back into J.K. Rowling’s world. 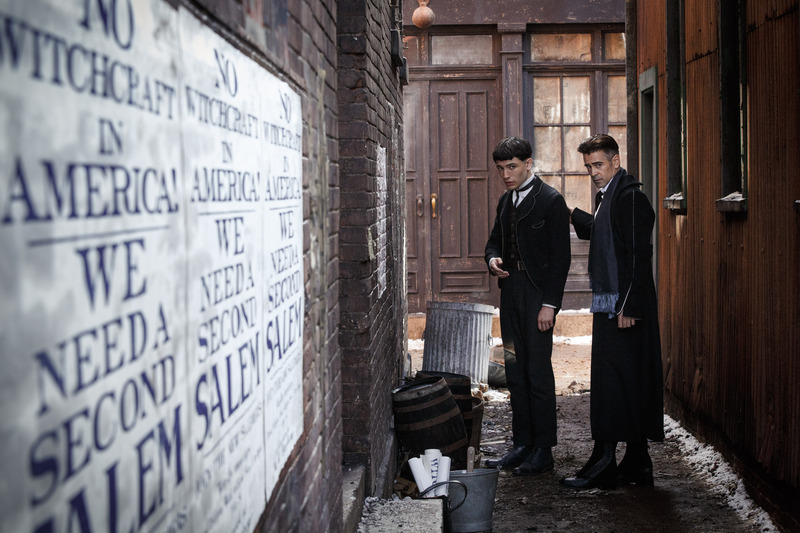 While still in the magical world, Fantastic Beasts delivers on a new level. Since we don’t have previous source material to look back on the experience of watching this film is more suspenseful. 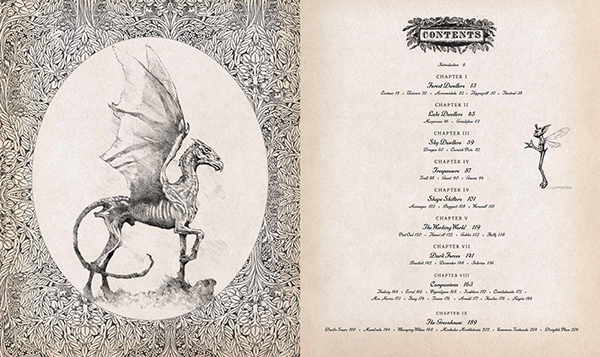 While we’re familiar with wizards and magic, Fantastic Beasts is completely new. Learning about the way American’s view magic and no-majs (muggles for us used to British terms) is an adventure. Fans will get to discover a whole new world with it’s own dangers. Wizards are on the brink of being discovered by muggles and the community is on high alert. 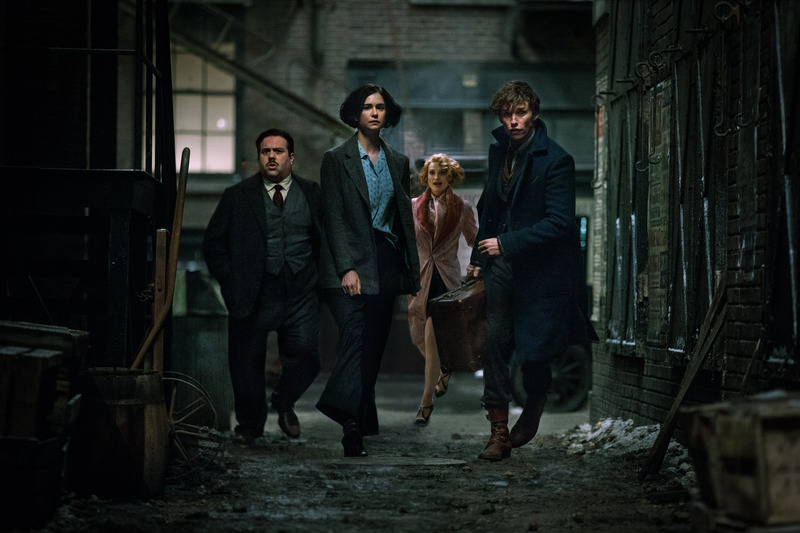 Newt’s appearance, along with the escape of his creatures, couldn’t have come at a worse time. The cast of Fantastic Beasts and Where to Find Them are all perfectly suited to their characters. 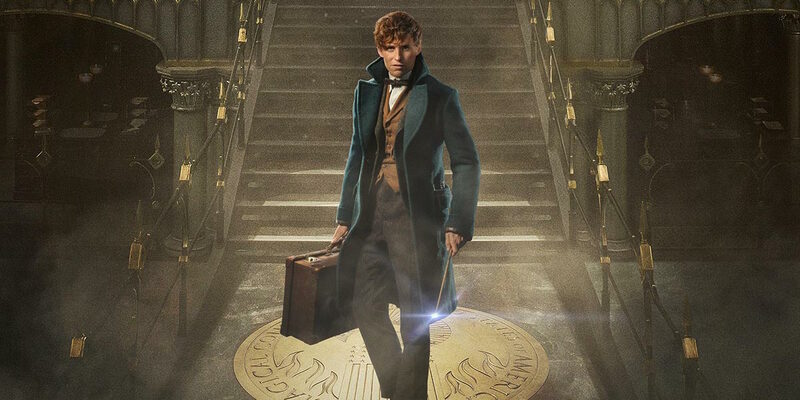 Eddie Redmayne’s charismatic performance perfectly captures the awkwardness of Newt Scamander, who spends more of his time with creatures than humans. He pairs up with no-maj and native New Yorker Jacob Kowalski, played by Dan Fogler, whose comedic timing adds fun to the film’s darker moments. Alison Sudol and Katherine Waterston add depth to sister duo Queenie and Porpentina (Tina) Goldstein who are more than just pretty faces. These four combine into a ragtag team of so called “outsiders” to uncover a great mystery. The cast is rounded out by Carmen Ejogo as President of MACUSA Seraphina Picquery, Colin Farell as auror Percival Graves, Samantha Morton as the Second Salemer’s head Mary Lou Barebone and Ezra Miller who masterfully portrays her oppressed adoptive son Credence. There are also wonderful performances by Ron Perlman as Gnarlack and Faith Wood-Blagrove as Modesty. 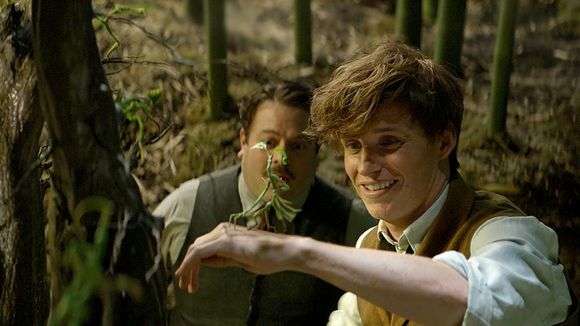 We can’t forget two of our favorite creatures – Pickett the bowtruckle and Newt’s niffler – who are sure to be fan favorites. We have a few other favorites but will leave their reveals for the film. One moment in particular made this reviewer, who is normally silent while at the theater, laugh out loud. Speaking of creatures, watching Newt interact with his creatures is one of the many highlights of the film. While there are many funny moments with them, we also see how much he deeply cares for every creature, even the misunderstood ones. The love and care he shows for these beings that most wizards would destroy is one of his best qualities. It is this characteristic that reminds us a bit of Hagrid, who also had an affinity for dangerous creatures. The fact that Fantastic Beasts is completely new material and not adapted from a book is what makes it such a great experience. We were able to fully immerse ourselves in the world without any prior biases from imagining the characters in our own minds. It really allows fans to appreciate the characters and story that much more. Fantastic Beasts is also completely separate from Harry Potter. So if you have family or friends that haven’t read the books or seen the films, they can safety watch Fantastic Beasts without any prior knowledge. Of course Jo Rowling has put a few nods to the Potter films that fans will appreciate. We won’t spoil them for you here, but do keep an eye out for at least a few Easter eggs, and we’re not just talking about name-dropping Dumbledore. In short – we laughed and we cried, we cried laughing, we gasped, and we have a renewed love of the wizarding world. If you see one film this holiday season, make it Fantastic Beasts! Don’t forget to get your tickets to see Fantastic Beasts and Where to Find Them ahead of it’s release on November 18th! 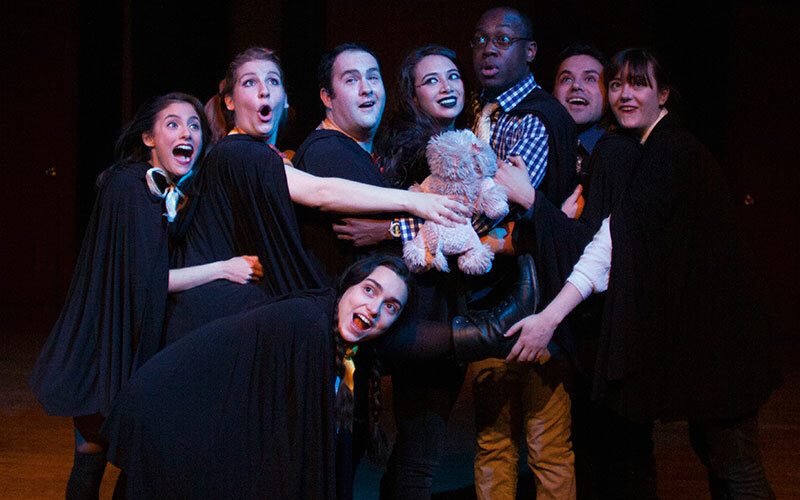 Last week our correspondent Alyssa was able to attend Puffs, or: Seven Increasingly Eventful Years at a Certain School of Magic & Magic in New York City. PUFFS takes a second look at everyone’s favorite world of wizards through the eyes of the Puffs, a lovable group of magical misfits. The full company features Langston Belton, Madeleine Bundy, Jessie Cannizzaro, Nick Carrillo, A.J. Ditty, Julie Ann Earls, James Fouhey, Andy Miller, Zac Moon, Eleanor Philips and Stephen Stout. Warning: some mild spoilers within. Disclaimer: the reviewer is a Hufflepuff herself, and may be liable for some bias. Since the advent of Pottermore, Hufflepuffs have had a surge in popularity. Originally framed as the ‘leftover’ house by the author and Potter fans alike, Hufflepuffs have recently been recognized and lifted up for their unglamorous but very worthy identifying traits. USAopoly have released a brand new deck building game, Harry Potter Hogwarts Battle! Take on the role of Harry, Hermione, Ron or Neville and battle against the Dark Arts to save Hogwarts. Players work together to acquire Items, Allies and Spells to defeat the Villains and win the game. So grab 2-4 friends and get battling! We haven’t had a chance to play the game yet so this is just an un-boxing post. There are 7 different games each based on one of the Potter films. As you play you integrate them into one another. For example, when you beat Game 1 you add cards from Game 2, then Game 3 and so on. They increase in difficulty as you add different villains to defeat and locations to save. As you win each game (by defeating the villains) you add the next set of cards from the following game. Your characters may get stunned and you’ll have to take penalties to continue gameplay. Cards are labeled with the game they’re from so you can easily start from the beginning without getting confused. The game is beautifully made and of the best quality. Many games these days skimp on production but each piece of this game has been meticulously designed and in the Potter theme. Included in the box are the gameboard, 7 sets of cards, player boards, villain tokens and chip pieces. The forces of evil are threatening to overrun HOGWARTS™ castle in this new cooperative game! It’s up to four students to ensure the safety of the school by defeating villains and consolidating their defenses. Players take on the role of a HOGWARTS student: Harry, Ron, Hermione or Neville, each with his or her own personal deck of cards. To secure the castle from the forces of evil the students must work together to build more powerful decks using iconic Wizarding World characters, spells, and items. Defeat all the villains including He-Who-Must-Not-Be-Named and win the game! USAopoly have re-released CLUE Harry Potter! Previous versions were available in 2008 and 2011 . 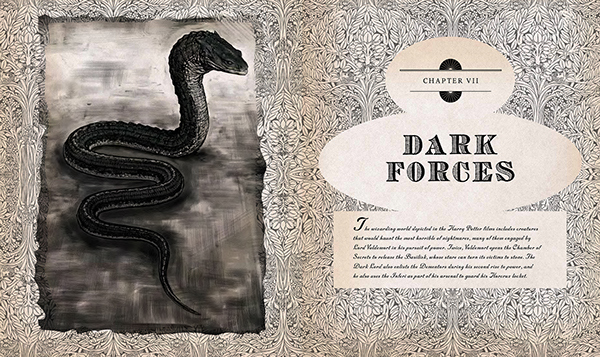 It features a moving Hogwarts board – super cool – and you could possibly encounter the Dark Mark. The game requires some assembly due to the movement of the game. You’ll have to separate the house points, suspect and item tokens as well as the wheels for the game board. There are 4 wheels that go with each house that work much like the moving staircases at Hogwarts. Gameplay is a little different from the classic Clue: you can play as Harry, Ron, Hermione, Ginny, Luna or Neville to figure out who attacked a fellow Hogwarts student. Unlike regular Clue, the players are not the suspects, one of the students is selected as the victim before players choose their character. Bellatrix, Draco, Lucius, Umbridge, Peter Pettigrew and Crabbe & Goyle are possible suspects. Players need to figure out WHO did it, WHAT spell or item they used and WHERE the student was attacked. The Hogwarts die decides if/when you spin one of the wheels (if it lands on a house you spin the wheel for that house.) If the dark mark shows on the wheel or the die you choose a card from the Dark Deck. There are also Help cards that you can pick up if the Hogwarts die lands on the star. The game is similar to classic Clue because you choose one of each of the mystery cards to put into the CLUE envelope. There will be an item, a suspect and a room. To make a suggestion, players must place the item and suspect tokens in the room they think the attack occurred, while in that room. You can make a suggestion in any room to try and figure out Who, What or Where. You must be in Dumbledore’s Office to make an accusation. House Points are used in tandem with the Dark Deck and Help Cards. When a Dark card is played you can use a Help card if it protects you from that specific thing. If not, you’ll have to give up House Points! If you run out of House Points, you lose the game! The game is a little weird at first for those used to the original, non-Harry Potter, Clue but once you get the hang of it and remember to turn the wheels, if necessary, it’s great fun! We loved that it mimicked Hogwarts’ moving staircases. Rather than just changing the characters and locations from the original to Potter characters this feels more in sync with the whole world of Harry Potter. When you’re sure you’ve solved the mystery: Go to Dumbledore’s office to make your accusation. A fellow student has seemingly vanished from the famous School of Witchcraft and Wizardry – and it is up to you to solve the mysterious disappearance. Playing as Harry, Ron, Hermione, Ginny, Luna or Neville, you must try and discover WHO did it, WHAT spell or item they used and WHERE the student was attacked. Move around Hogwarts making suggestions…but watch out! Wheels on the board will keep changing revealing secret passages, moving staircases or even the Dark Mark! Protection from the Dark Mark comes from the spells, allies and items provided by the Help Cards. When you’re sure of your facts go to Dumbledore’s office to make your accusation and win the game! 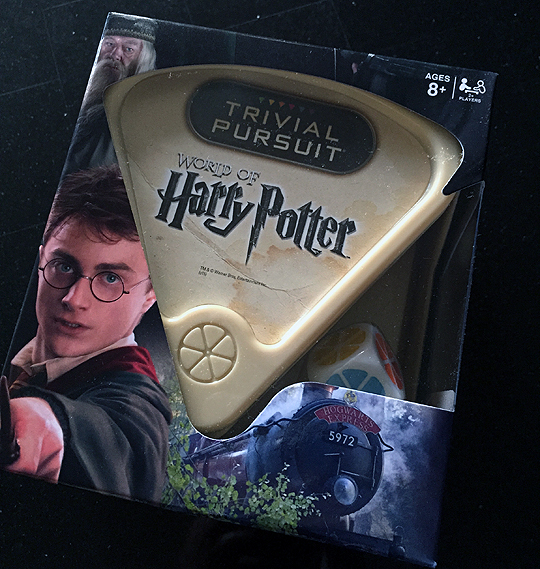 The lovely folks over at USAopoly have sent us a copy of their new game, World of Harry Potter Trivial Pursuit, for review. They also provided a second for a giveaway! Sadly it is only open to our fans in North America. Details on the review are at the bottom of this post, now it’s time for the review. Comprised of 600 trivia questions that span across the entire Potter universe, Harry Potter Trivial Pursuit features 6 categories including: The Dark Arts, HOGWARTS™, Magical Spells & Potions, Magical Objects, Magical People, and Animals & Magical Creatures. Now you can answer questions like, “What is the full name of the driver on the night bus?” from the Magical People category, or questions like “What does Dumbledore conjure to protect himself and Harry from the Inferi in the cave?” from the Dark Arts category. The great thing about this game is that it’s portable. It comes in a small triangular shaped box with the cards and a die so you can play anywhere you want. Long road trip ahead? Pack the game! Babysitting some Potter fans? Bring it along and teach them your ways. Another cool thing is you can use the cards along with your full version of trivial pursuit as well. Since this is a mini version of the game, it is also completed much quicker than the classic version. There are a few ways to play depending on the speed you want it finished. I am the Harry Potter genius in my local group of friends so, when we played, it was a little bit one sided. However, even though I was the champion, obviously, everyone really enjoyed the game! We didn’t get through all cards, but there are some that can challenge even the smartest Potter fan. I can’t wait to play the game with my die-hard Potter friends. Sadly we live all over the country so it may be some time before that happens. But when it does, it will be a battle royale! And now, the giveaway! The only mandatory entry is leaving your email so we can contact you if you are the winner. Everything else is optional. 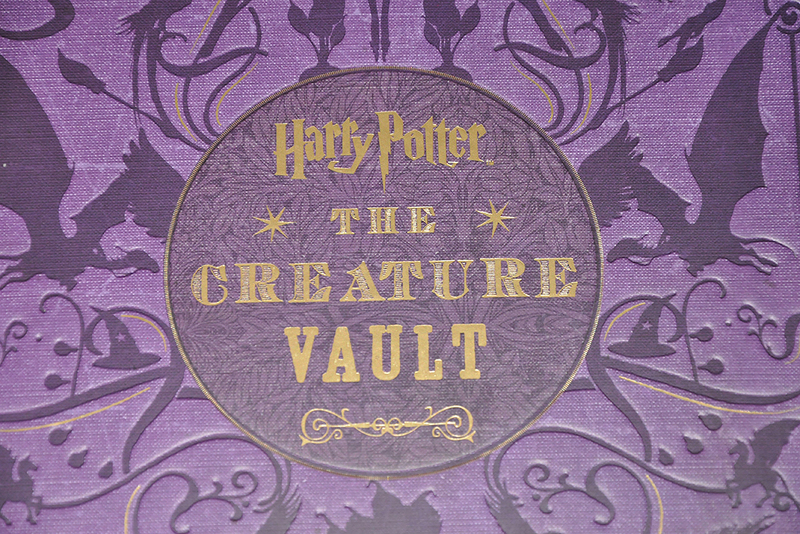 If you’re looking for a gift for a Harry Potter film lover this holiday season, look no further than The Creature Vault: The Creatures and Plants of the Harry Potter Films from Harper Collins. While the Collectors Edition of Harry Potter From Page to Screen: The Complete Filmmaking Journey includes a book on the creatures of Harry Potter, titled “The Creature Shop Compendium,” this new book from Harper Collins will be a great addition to any Potter fan’s collection. 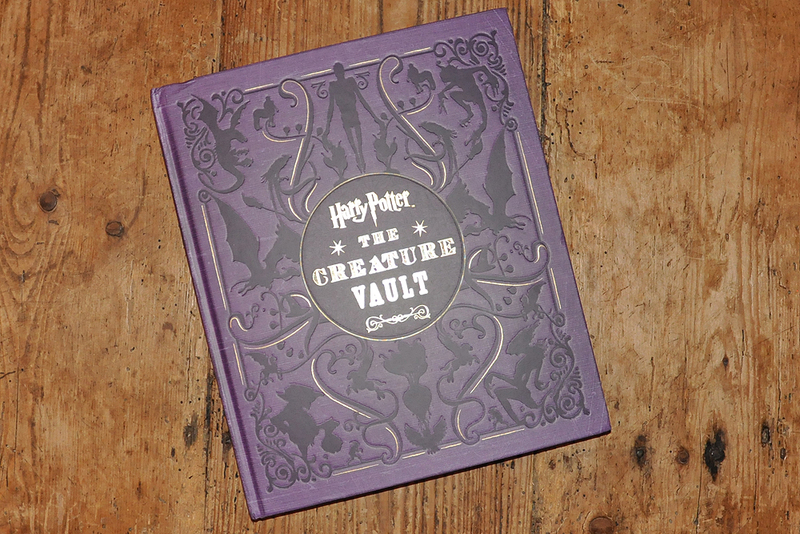 For one thing, many people simply do not have $600 to spend on a collection of books and The Creature Vault is only $27 at Barnes & Noble or Amazon. The book, out October 28th, also has 208 pages while the other edition only has 127. This new publication contains a LOT more material. 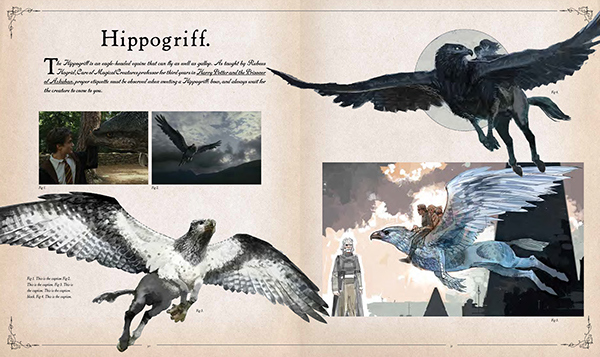 The earlier book is mostly comprised of photos while this combines imagery with all the information you could want on the creatures in the films. Harper Collins sent us a copy to review, and here are our thoughts! We went over the basics, now let’s dig in a little deeper. 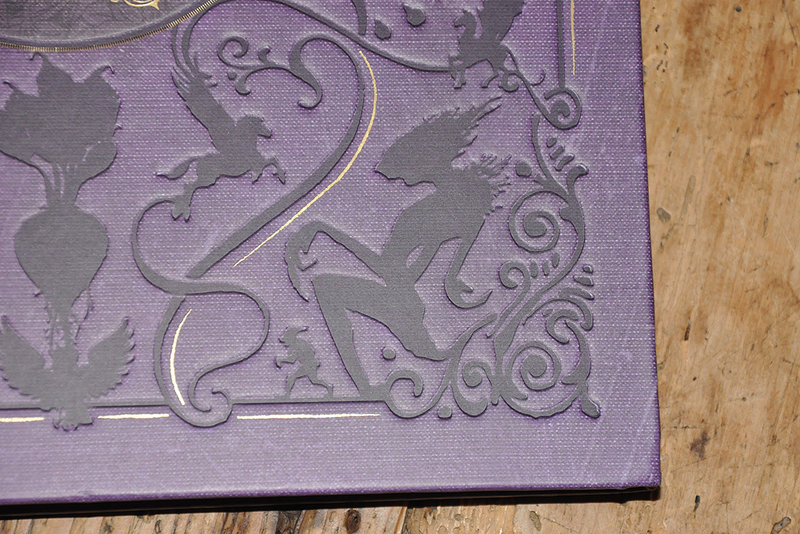 The quality is beautiful, just picking up the book stimulates the senses with it’s textured cover (creatures are debossed in a dark purple.) 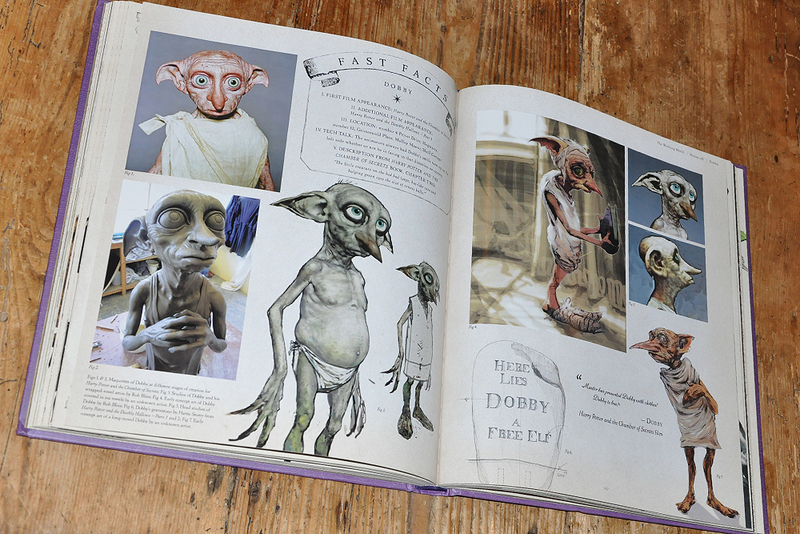 The attention to detail in the creation of this book is apparent, the cover was designed to look worn out, almost as if it is part of the Potter universe. 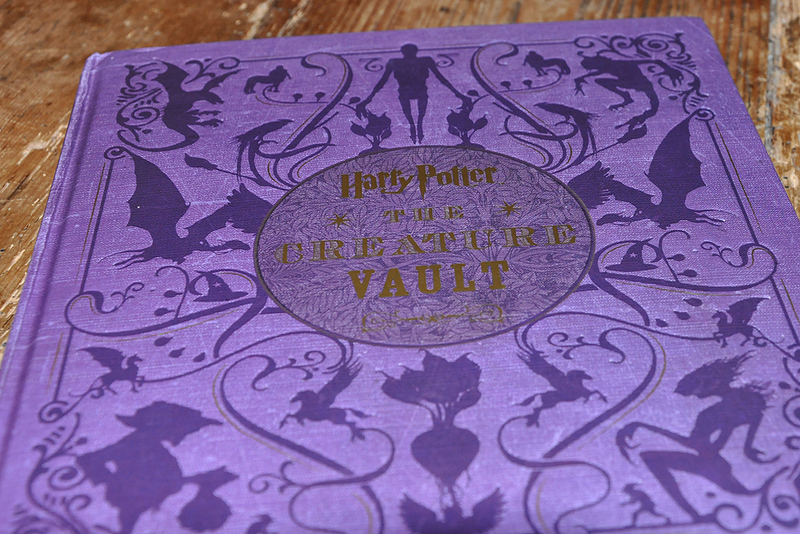 The book also contains a poster depicting some of the world’s favorite magical creates. 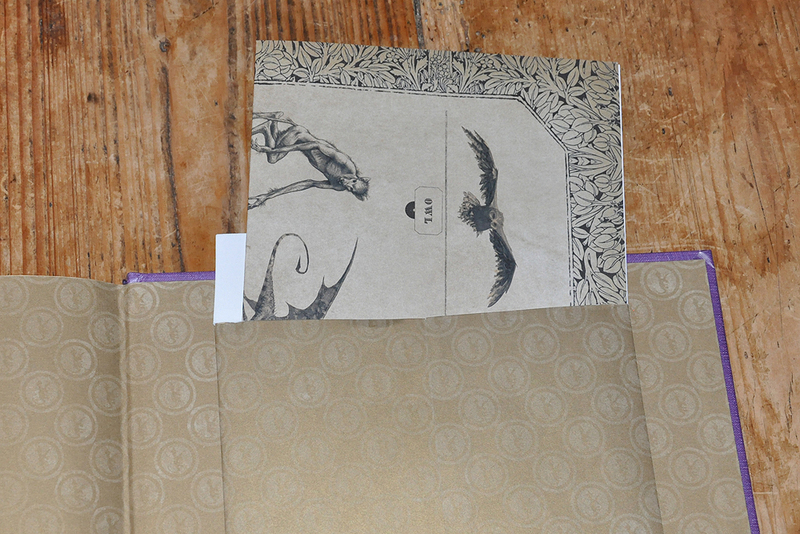 It is concealed in an envelope on the back cover of the book. Inside find gorgeous full color photographs in the form of film stills, concept art and behind the scenes photos as well as detailed sketches of creatures we saw in the films and some we never got to see due to cuts. Perhaps we’ll have the chance in the upcoming Fantastic Beats and Where to Find Them films? Additional Film Appearances: Harry Potter and the Chamber of Secrets, Harry Potter and the Prisoner of Azkaban, Harry Potter and the Goblet of Fire, Harry Potter and the Order of the Phoenix, Harry Potter and the Half-Blood Prince, and Harry Potter and the Deathly Hallows: Part 2.